Hard Rock Treks and Expedition is one of the most popular trekking and travel agency of Nepal, which offers you unobtrusively, personalized services and facilities for groups and individuals adventures tours, inclusive of the entire train in the Himalayan kingdom. Hard Rock Treks and Expedition covers both the soft trails of Kathmandu valley and “Hard Rocks” of our Himalayan summits. It is always first hand experience to travel with local agent directly. Time has changed,It is possible to buy tours with Nepali agent inexpensively from your home town. Just click on to www.hardrocktreks.com we guarantee you the best service and save your money. We worked extensively to let our client enjoy more and pay less.With an extensive experience in tourism field for more than a decade we believe that all our effort to make our customer happy, to provide them the value of money, and more than that the value of their time is our motto. Open your eyes to the new world, Hard Rock Treks and Expedition provides you the best view! Owner and tour planner of this company Mr Bharat Shahi Thakuri “Om” has leaded many trips very effectively and also worked for British and Dutch tour companies as a tour leader. He is a founder & back-bone of this company and is always with new ideas.He has twenty five years of experience in tourism in Nepal & he is a muti linguale. He says let people know what we do and how much wecharge because it’s their money and their right to know. Mr, Thakuri also worked for two years as a secretary of association for tourism. Hard Rock Treks is the only company transparent about their margins with the clients. Rana Bahadur Khadka Director and his involvement in tourism related association for long time makes Hard Rock Treks and Expedition to work effectively in promoting Nepal hand in hand with government and with other tourism entrepreneur. Elected president of association for tourism and past secretary of Trekking agents association of Nepal (TAAN), Mr Khadka is renowned organization member. HRT believes in serving people so to serve our clients is one and the next is to serve to the deprived people. We have parted 10% of our benefits yearly to help for girl’s education. Being poor and undeveloped country Gender discrimination is widely practiced in Nepal, we believe that to eliminate gender discrimination education is the key weapon. Very special thanks go to our clients who worked hand in hand with us to support our project and we heartily invite anybody with same concern. If you have any quarries feel free to contact us. Our maximum effort is also to hinder human rights violation in Nepal. We publish poster to aware people to work against human right violation. Without human rights there is no space to stand for the people so it is the root to uplift anybody. Hard Rock Treks and expedition (P) Ltd is one of the leading trekking comp any in Nepal. We are specialized for Trekking tour, white water river rafting tour, peak climbing, wild life excursion, hotel reservation and domestic air ticket. It is a simple answer to the complex needs of foreign tour operators. It is a dynamic integration of couple of group companies jointly owned and managed by tourism professionals from the industry. Hard Rock treks and expedition (p) ltd is a specialist destination management company and inbound tour operators based in Kathmandu valley and Pokhara. We are offering a wide range of designed itineraries for all your group travel needs in Nepal and Tibet. We provide complete hotel, transport and entertainment packages, from chauffeur driven limousines and five star luxuries to coach tours and mid range value for money accommodation. We also organise cultural packages such as architectural and theatrical tours, as well as sporting event packages. We specialize in Nepal and Tibet as a tourist Destination, working with tour operators based abroad to plan, organize and execute the perfect travel options for their clients, whether these are Individual Travelers (FIT), Groups, Conferences or Incentives. We are approved by ministry of tourism in Nepal and are member of trade bodies like TAAN (Trekking agent association of Nepal) NMA (Nepal mountaineering association) NTB (Nepal tourism board). To provide a highly innovative, quality and personalized service to your clients to ensure a memorable and trouble free holiday experience in Nepal and Tibet. Hard Rock Treks and expedition (p) ltd vast resources include extensive research capabilities coupled with staff members who posse’s rich experience in travel management methodology and techniques. With over 15 highly dedicated, experienced and multilingual travel experts, we provide an enormous knowledge base of our destinations with a passion for travel that shows. Our employees receive constant updating of skills to ensure that you are receiving the best service available. Owner and tour planner of this company Mr Bharat Shahi Thakuri “Om” has leaded many trips very effectively and also worked for British and Dutch companies as a tour leader. He is a founder & back-bone of this company and is always with new ideas. He has twenty one years of experience in tourism in Nepal & he is a muti linguale. He says let people know what we do and how much we charge because it’s their money and their right to know. Mr, Thakuri also worked for two years as a secretary of association for tourism. Hard Rock Treks is the only company transparent about their margins with the clients. We have teams of experienced professionals dedicated to providing tour operators with the best travel solutions for their clients. We’ve been providing a wide range of travel-related services for our customers. With an extensive network, we can handle every type of traveler including wholesalers, tour operators, incentive houses, travel agents, cruise lines and airlines. We have specialist departments to deal with? Individual Travelers? Groups? Special Events ? Incentives ? Conferences & Exhibitions ? Sporting & Cultural Events Individual. Our experienced, multi-lingual FIT department is well equipped to offer a high-class, flexible service at competitive rates. We provide customized solutions to your clients travel requirements and can cater for the more unusual, whether that is a wedding or a balloon trip, a cross-country riding holiday or a tour of championship golf courses. Once accommodation and travel arrangements are taken care of we can organise sightseeing, excursions, car hire, public transport, and tickets for theatres and sporting events. Whether you require a programme using charter flights or a one off VIP client our FIT department is delighted to put together suggested itineraries and prices. Special Events Our staff would be delighted to discuss any special events you wish to organise in Nepal or Tibet. We provide a full range of services from hotel accommodation, multi-lingual tour guides, coaches and other transportation, ferries and cruises, lunch and dinner options, including themed banquets, entertainment and sporting and cultural activities. All our quotations are custom made to suit your client’s exact requirements and budget and we aim to provide the exceptional, to make your group tour be remembered for its individuality as well as the high standard of service. We can arrange for individual or group attendance at major sporting and cultural events through out Nepal. What is so special about our service? We guarantee that the price you see on our site or get from us is the lowest for that tour package. You will not find a lower price for the same tour package anywhere. We are competitive and cost effective. We deliver what we promise. The latest technology has not shaken its faith in old fashioned values like honesty and commitment to excellence. As a company to the promotion of business and tourism in Nepal , Hard Rock is totally committed- Thus, when you come to our organization that gives 100% of its attention and effort to fulfill your needs. Hard rock has a personalized touch marked by characteristic hospitality and endeavour to serve to the best. After more than 21 years of business, we have crystallised our focus on how to handle every traveller’s needs. we have the local knowledge and expertise to ensure your clients get a memorable trip wherever they chose to go in Nepal. We work with tour operators based abroad to plan, organize and execute the perfect travel options for their clients, whether these are Individual Travellers (FIT), Groups, Conferences or Incentives. Nepal, a destination for high – altitude trekking Of the many attractions in Nepal, trekking in Langtang, just north of Kathmandu, provides an unsullied vista of the magnificent Himalaya mountains – without scaling Everest. Nepal is famous for its magnificent mountains and rugged high altitude trekking. For the best weather and views, go right about now (late September to December) or between February and May. But for an unforgettable vacation far form the madding crowd, Nepal also offers much, much more. This writer and a Thai friend were in Nepal in June and July, during the rainy season when tourists are few. It was very pleasant to have the whole country “to ourselves”, so to speak, thought the rain made it impossible for us to trek, The capital, Kathmandu, is a charming and interesting small city and breath of fresh air to anyone arriving form Bangkok. The city is set in a large valley surrounded by the foothills of the Himalayas; attractions nearby include the Swayambhunath stupa, the Hindu temples at Pashupatinath, and the quaint town of Bhaktapur, where you can walk for hours without seeing an automobile. At Royal Chitwan National Park on the Terai plain, you can ride on elephant, take an escorted hike in search of wild rihinos and other exotic beasts, and visit and elephant breeding farm. Just outside the valley is Nagarkot, the spot nearest Kathmandu where the highest snow-clad Himalayas are visible. We din’t make it to Nagarkot, but all reports say a nights there – and a very early morning to see the breathtaking sunrise – are well worth it. 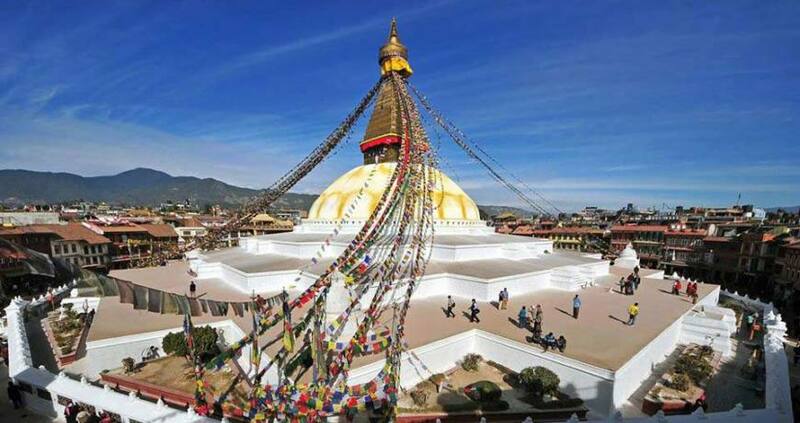 While it is extremely unlikely you will be robbed or cheated in Nepal – the people are wonderfully friendly and generally very honest- some tourist have experienced in convenience because of bureaucracy or inefficiency. We had a frustrating encounter with officialdom at the airport. My Thai friend had obtained a visa at the Nepalese Embassy here in Bangkok – which we later learned is not necessary through no fault of her own my friend’s visa was stamped too soon (It’s a long story). We tried and tried to explain that immigration officials had made a mistake, but the immigration department insisted she pay another US40 for new visa. Royal Nepal Airlines also was at fault; they were not willing to give my friend a rebate on her fare, though they did upgrade us both to Shangrila – Classs, the airlines’s highest class, for our flight back to Bangkok. An excellent firm to contact for arrangements once you are in Kathmandu is Hard Rock Treks & Expedition of Thamel look for the sign around the corner from Potala Guest House Mr. Bharat, “OM” Shahi, proprietor of Hard Rock Treks, is a member of the Association for Tourism a private civic group dedicated to making your life as a visitor to Nepal as pleasant and hassle free as possible. Mr. Shahi says the group’s purpose is to make sure tourist will not be hassled or cheated, so they will enjoy their stay and want to return. The groups self assigned duties include giving correct information about Hotels and Other Services keeping the airport clean, and controlling soliciting at the airport “ If you are in trouble we can help you” Says Mr. Shahi. The group also participates in civic events such as national Day, Non- Smoking Day and Labour Day, and promotes reforestation and security in tourist areas. Fees paid by members finance it. A representative of the Association for Tourism is on hand in the airport arrival hall to greet every incoming flight, wearing on ID card a white shirt, blue pants and a black tie. Mr Shahi provides excellent, well-informed advice about trekking and other activities. He strongly recommends the relatively unsullied Langtang Trek north of Kathmandu. “Langtnag is very nice area” he says, adding “And the people are nice and more friendly then on the other Trek”. And you don’t have to climb as steeply as you do on Annapurna or Everest.